Ever since their formation in Zwolle Netherlands, by former Within Temptation keyboardist Martijn Westerholt and super siren Charlotte Wessels, Dutch symphonic metallers Delain have been on the fast track to success. Their drive and determination can be seen and felt in the sheer volume of amazing music they are putting out on a regular basis. 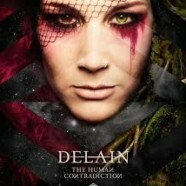 The past few years have been extremely busy for Delain. Having embarked on a non-stop schedule of touring behind their newest musical endeavors, such as 2012’s epic We Are The Others and 2013’s Interlude, both of which featured the mega smash “Are You Done With Me,” a song that is by far the most commercial and radio friendly thing they have done so far in their illustrious career. Building on the monster success of We Are The Others and Interlude, they have released their newest opus for Napalm Records, entitled The Human Contradiction on April 8th, soon to be followed by yet another tour, this time with Sonata Arctica and Xandria. The Human Contradiction engulfs you like a massive python, causing your heart to race, then pierces your soul like the fangs of a deadly rattlesnake. It’s venom infects your body, leaving you helpless to resist. It will also serve as a stout reminder to all their contemporaries, as to just how symphonic metal can and should be done. From the primordial riffs and mainstream edge of lead single “Stardust” to the full- on symphonic assault of “Tell Me, Mechanist” which is by far the heaviest thing on the album, due in part to the brutal guest vocals of Orphanage frontman George Oosthoek that serve to take the song to the next level of heavy. There is something for everyone to enjoy on The Human Contradiction. Tracks like “Army Of Dolls” and “Lullaby” maintain the bands symphonic roots while at the same time sees them exploring the heavier, darker side of Lacuna Coil or Lullacry, interweaving them with infectious as hell, radio ready choruses, that touch on the hard rock sounds of Halestorm and The Pretty Reckless. The insidious melodies and intoxicating rhythms of “My Masquerade” oscillates between Within Temptation and Nightwish and goes to further prove that music can be both melodic and brutal as hell at the same time. While the guest vocals of former The Agonist and current Arch Enemy frontwoman Alissa White-Gluz on closing epic “The Tragedy Of The Commons,” allows the song to walk the fine line between beauty and beast. It is a bold statement that says “We saved the best for last” and will leave you absolutely stunned. Here’s the bottom line- While the elements and influences of all the aforementioned bands can be heard on The Human Contradiction, Delain manage to maintain a musical identity that is all their own. It won’t be long before this talented band is no longer walking in the shadows of their peers, but setting the standard.